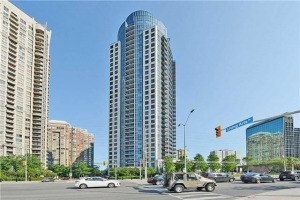 Ultra Ovation Condos for sale in Mississauga | 330 Burnhamthorpe Rd W.
Ultra Ovation condominium is located at the intersection of Burnhampthorpe and Living Arts Dr., right next to Tridel's Grand Ovation in the Mississauga City Centre area. Ultra Ovation is a 32 storey stand-alone, ultra-modern condo residence with cylindrical glass exterior built by Tridel in 2010. Ultra Ovation is the final phase of Tridel's master planned Ovation community in Mississauga City Centre. Ultra Ovation suites offer luxury, style, safety and comfort. Ultra Ovation condominiums are built environmental friendly and offer savings on energy bills. Suites come with nine or ten feet ceilings (depends on floors level), contemporary finishes, plank or strip laminate floors, gourmet kitchens with granite counter tops, Whirlpool brand appliances, luxurious bathrooms, personally encoded suite intrusion system, central building water filtration system, vertical fan coil heating and cooling system, high speed telephone and cable wiring, separate metering of electricity, heating and cooling. Tridel Ultra Ovation's amenities include ultra-chic party room, swimming pool, lobby featuring an intimate seating, an attentive 24-hour concierge. Ultra Club's party lounge has seating areas looking onto a central, double-sided fireplace, curved patterned benches, a sleek bar, café-style seating and a fully-equipped caterer's kitchen. The contemporary design will continue to flow seamlessly throughout the billiard lounge, golf centre, dining & cards room, indoor swimming pool and state-of-the-art exercise room with spacious aerobic studio. Ultra Ovation Condos are next to Grand Ovation Condos and across Mississauga Library and YMCA. Team Kalia has helped many residents with buying, selling or renting their homes and condos in Mississauga's Square One area since 2003. Call us if you are thinking of buying, selling, investing or renting an Ultra Ovation Condo in the Square One area. Team Kalia is sure to bring you great value. Local Experience always Pays!